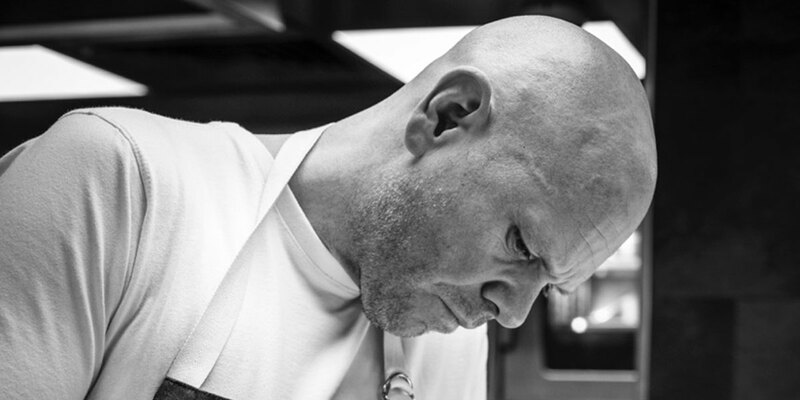 By Tom Kerridge, The Hand and Flowers in Marlow. Sift the flour, mixed spice, cinnamon and bicarbonate of soda into a large bowl. Stir in the suet and dried fruit then the golden syrup. Add the milk, then get your hands in there and mix to form a soft clootie dough. Dip a clean tea towel or large piece of muslin in boiling water then wring out. Place the tea towel or muslin (doubled over so you have two layers) on a chopping board. Dust the cloth generously with flour. Place the clootie dough in the middle of the cloth and draw the sides up to form a rough ball shape - don’t wrap it too tightly as the dumpling will expand a bit as it cooks. Tie the top tightly with kitchen string. Place an inverted, heatproof plate or a trivet in the bottom of a large, deep saucepan. Place the wrapped dumpling on top and fill the pan with boiling water from tree kettle until it covers the dumpling. Bring back to the boil then turn down the heat down to a gentle simmer and put the lid on. Poach in the pan for 4 hours. Check a couple of times during the cooking process and top up with boiling water from a kettle if the level looks low. After 4 hours, place a large bowl of iced water by the hob. Carefully remove the pudding and quickly plunge the whole thing, still in the cloth, into the iced water. This helps release the cloth from the pudding without it sticking. Preheat the oven to 180oC/Gas Mark 4. Line a baking tray with baking parchment. Remove the cloth from the pudding, place it on the baking tray and bake for 15 minutes to dry out and develop a light crust. Remove from the oven, dust it with caster sugar and leave to one side to rest. While the dumpling is resting, make the custard. Pour the milk and cream into a saucepan with the cloves and bring to the boil. In a separate bowl, whisk the egg yolks, sugar and ginger together until they are light and fluffy. Pour on the hot milk and cream, whisk together then return to then pan and place it back on gentle heat. Cook, stirring constantly, until the mixture reads 82oC on an instant- read thermometer or until it coats the back of the wooden spoon. Pass the mix through a fine sieve into a warmed jug. Dust the warm clootie dumpling with icing sugar before serving with the custard. If you don’t eat it all, the custard will keep for up to three days sealed in the fridge and the dumpling is also delicious served cold.